Complete metamorphosis is a process in which an animal's appearance changes completely. It often changes so much that the different stages seem as though they were different animals. One of the most prominent animals that goes through this process is known as the Lepidopteran (butterflies and moths). The insects that undergo this process go through a series of three stages. 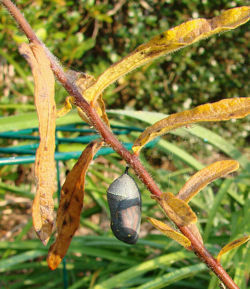 These stages are the larva stage, then the pupa stage (chrysalis or cocoon), followed by the adult stage. Complete metamorphosis is also known as holometabolism. Another type of metamorphosis is known as incomplete metamorphosis, which is also referred to as hemimetabolism. This phase is unlike the complete metamorphosis because it goes through three stages, but they are different then the complete stages. The stages of the incomplete metamorphosis are egg, nymph and adult. These stages are not equivalent to the complete stages in that the nymph is not the same as the pupa. The nymph is like a miniature version of the adult in that they have the same features. The stages of the incomplete metamorphosis are gradual and are not drastic. Some examples of this would be earwigs, dragonflies, crickets, and praying mantis. The insects of the incomplete nature are also further split up into two other groups known as paurometaboly and heterometaboly. In the paurometaboly an insect will live in the same environment when it is a nymph and when it is an adult. Two insects that are in this group are the grasshoppers and the true bugs. The heterometaboly are the opposite of this in that they live in different environments when they are a nymph and when they are then an adult. Amphibian metamorphosis is when a single amphibian changes from a larvae, otherwise known as a tadpole, to an adult. Usually, eggs are laid in water. The tadpole then emerges from the egg and swims freely within the water. The tadpole has gills, a tail and a small circular mouth. The tadpole will grow, until it begins metamorphosis. Metamorphosis begins with the development of the hind legs, then the front legs. The lungs develop, and the tadpole begins to swim to the surface of the water to breathe. The intestine shortens to accommodate a carnivorous diet, and the eyes migrate rostrally and dorsally. In frogs the tail is absorbed by the body, for the last stage of metamorphosis. This page was last modified on 14 February 2014, at 15:58.